Since Christmas is just around the corner it’s time to think about the gifts you’ll get your loved ones. Your muscle car should most definitely be on that list below your kids, but possibly tied with your dog. Here are the Top 3 three things he (or she) wants from the Santa this year! I want a new carb kit, some new tires, ……. I know what you’re thinking – “roll bars don’t make cars go faster, Moron!” Technically, you’re correct. The roll bar itself does not make the car go faster….but it does make it safer, which it turn means you can drive it at speeds you would not have before. If you want to participate in the sub 10-second class at your favorite drag strip or enter into the top-speed classes in the Silver State Classic, a roll cage is a must. Chances are that if you’re a hot rodder you already have plenty of ponies under the hood. The roll bar is the insurance you need to use them! Plus, is there anything cooler looking than a muscle car with a roll bar in it? Tell Santa to give Summit Racing or Jegs a call today! A nice free flowing exhaust (like one from Magnaflow, Flowmaster, or your local custom exhaust shop) is just what the Doctor ordered for your 100% bone stock car. It will help it breathe better than the original pipes, make better power, and will honestly drive like you filled up the tank with the “good” gas. Better yet, it’s completely removable – and you can return to stock at anytime without anyone being the wiser! If you’re feeling extra courageous, get a set of headers along with it. Since most of the muscle cars we own are 30+ years old, sometimes a nice restoration part really helps complete the package. Chances are that at least something on your car is broken, worn out, etc., so this is the chance to do something about it. Here is a little tip – stick to interior items. Car guys and gals almost always focus on the functional things over the form things, but this time around try to hit something that’s in the cockpit (like new door panels, dash bezel, refreshed gauges, etc.) . You’ll be surprised at how much it improves the driving experience….and your mood! Head over to your favorite resoration parts company website now and pick out something for your car. Be sure to let your friends and family know what you chose – they’ll pass that on to Mr. Claus for you and your car. 3) A trip next year with you! There you go! 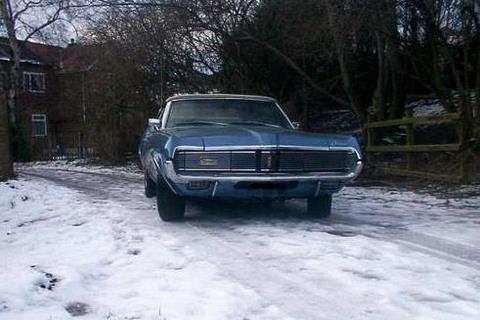 Make sure your muscle car has a nice Christmas this year – because it will make next year nice for you!